We have a 10×25 storage unit in our traditional buildings available! This is rare as these are a hot commodity! 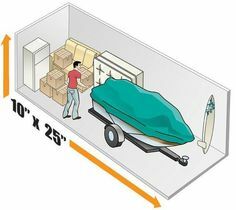 10×25 traditional units are great for storing a vehicle, leaving extra room for miscellaneous items like spare tires or tools. These are also great to store the contents of a 3 bedroom house which includes the big items such as a couch, mattress sets, table and chairs etc. Don’t forget, we have the storage calculator on our website if you are unsure of what size you actually need. Come in and see our facility today! We are here 7 days a week.